Justice For Pet Dog, Brutally Killed By Police, Langzhong, China!! 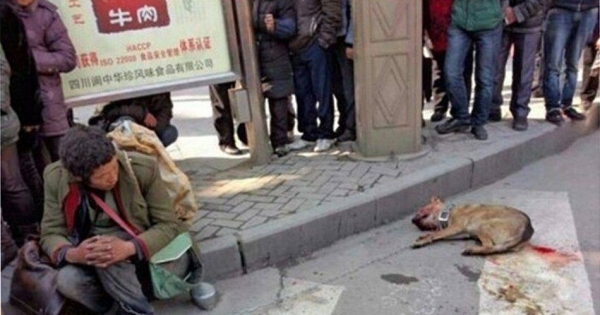 On 4th March 2014, police in Langzhong City, Sichuan, China, brutally killed a pet dog belonging to a homeless man. The killing was done during the day near a primary school for no reason at all and is totally unacceptable. The dog was still chained when the police forcefully removed it from it's owner who could do nothing but watch while his companion was beaten to death with sticks and shovels in front of him. The police later issued a statement defending their actions, saying that the dog's presence might have posed a threat to human safety but this just shows the ignorance and cruelty involved in their actions and shows the world how unfeeling they are. The people in charge in the relevant departments of the government now need to show the world that they condemn this killing, along with Chinese citizens and people around the world, by implementing the Small Animal Protection Law. Groups on Weibo are condemning the killing and petitions have been started. Help Chinese activists and animal lovers get protection for their animals.